Now it is easy for you to move your contacts between Zoho Invoice and your mail clients (address books) like Microsoft Outlook, Mac Address Book, GMail, Yahoo mail etc. Yes, we are happy to announce the support for vCard import and export, the most commonly used standard to manage and transfer contact information. How do I import the contacts from my mail client to Zoho Invoice? The first step will be to export the contacts from your mail client in vCard format. The procedure to export contact information as vCard differs for each mail client. Here I have explained the procedure for one of the most popular mailing service – GMail. Shortly we will be publishing the procedure for other popular mail clients in our help docs. Click on the “Contacts” link and select the contacts you want to export. Click on the “Export” link and select “vCard format” for exporting the data. Click on the “Export” button and save the file. Now Sing-in to your Zoho Invoice account. Click on the “Customers” tab and click on the “Contacts” link on the left. Click on the “Import Contacts” link at the top right. Click on the “Import” link next to “vCard”. Browse and give the file that you have saved from your mail client. All your contacts will be imported into Zoho Invoice. Note: We will re-use the “last name” of the contact for Company/organization name if it is not specified for the contact. How do I export the contacts from Zoho Invoice? Sign-in to your Zoho Invoice account. Now click on the “Export Contacts” link at the top right. In the export page that comes up, click on the “Download” link next to “vCard”. All your contacts will be exported as a single vCard file. You also have to option to import or export your contacts individually from the contact’s details page. Hope you find this feature useful; don’t forget to share your comments with us, as it goes a long way in improving our service. So can individual contacts be imported or copied into ZOHO from Thunderbird via V-Card? @tauselfietSorry for the issue you have faced. With the existing Contacts Import, we support only “.csv” format files. Kindly, try exporting the contacts from yahoo in .csv format and import it to zoho.We are in the process of enhancing the existing Zoho Contacts (Address Book) and import functionality, which is going to be release soon. Stay tuned.Pandyah ! I have tried to precisely follow the above instructions, but failed in importing my yahoo.de addressbook. Maybe this is due to a failure in the german version of zoho or yahoo? In fact, there is only a general Import Link, which allows to choose between importing from the desktop, gmail or yahoo (and no import link next to vcard, which does not appear on that page). When I click on the import from yahoo link, then I am asked to log in into my yahoo account and nothing further happens. I have also exported my addressbook from yahoo as vCard (both as single files in a zip folder, and as a single file) but when I try to import them into zoho, the error message “invalid file format” comes up. Could you please help me resolve this problem for I have lost enough time on it already? 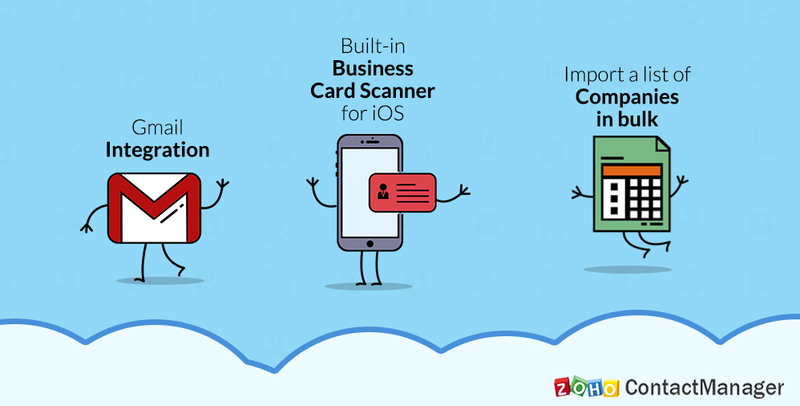 Say hello to Zoho ContactManager’s newest updates. Here’s what you can look forward to!